Harm is a byproduct of the human condition, but luckily most of humanity is inherently equipped to ward against death, damage and danger — the culmination of that bodily equipment comes in the form of situational awareness. Gun owners know better than most the importance of preparation, and while this may be review for some, dispelling conflict should always come before discharging ammunition. Situational awareness is the means by which individuals can prepare themselves by warding against and potentially shifting the outcome of negative, harmful and external factors outside their control. This is done by actively understanding, perceiving and reacting to all environmental, personal, informational and other factors operating around (and possibly at the detriment of) the individual. Figuratively, situational awareness is finding shelter or cover in the calm before the storm. A real world scenario: Christian must travel across town in order to get to the store to refill a prescription. He knows the route to the pharmacy, but has recently seen news coverage that crime has spiked in an area that lies directly on the path he must travel. He reacts to this knowledge by arming himself appropriately and legally, but plans to circumvent the potentially dangerous neighborhood by taking a detour along the way. Additionally, knowing that there’s the potential for a threat to safety, he decides not to wear headphones and to be aware of the stimuli around him. Christian manages to avoid conflict and gets home safely. It’s easy to say “find another route,” but the underlying methodology is the same whether in a dangerous situation or not. Situational awareness means analyzing all factors, threats and meaningful information in a setting, around others or through predetermined criteria, but it also means making an actionable decision that creates the highest likelihood of personal survival. Know what’s going on. React. Simple — that is, until there’s adrenaline pumping, unforeseen circumstances and potentially unmanageable threats. Training the mind and body in advance will help establish the best course of action. That being said, there are modes of awareness and preparedness established by well known soldiers and firearms professionals. Colonel John Boyd defined the OODA Loop decades ago as a means of human reaction. Boyd, a military strategist who served in the Korean War, is a celebrated F-86 pilot who redefined aerial combat and the means by which someone can intelligently respond to a given scenario. OODA means observe, orient, decide and act. On its surface, it’s a fairly straightforward formula. Observe: use all applicable senses to perceive every environmental factor able to be gleaned. Orient: competently, quickly and carefully focus on and analyze the information gathered. Decide: create a critical response to the information at hand. Act: follow through with a course of action based on the analyzed factors at hand. This loop is intended to outperform opponents and mentally position the user at the upper hand. There are factors that work against its full use though, understandably, like bodily and mental fatigue that limits the ability to process information. Knowing how to position the mind and body given a situation is one thing, but there is protocol on how to consistently be in a mode of preparation at all times. Jeff Cooper’s Color Code is all about framing the mind around thresholds of alertness. 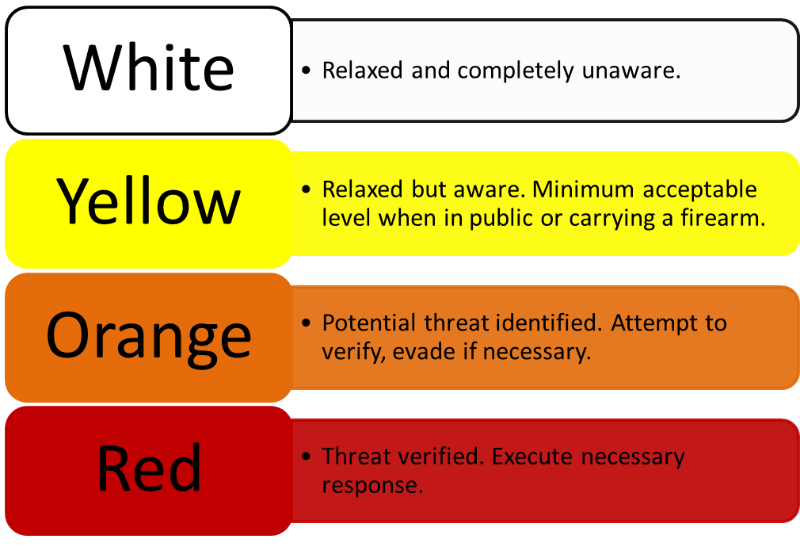 Cooper, a former marine and creator of modern handgun techniques and safety standards, outlined that there are four levels of alert behavior coded by color: white, yellow, orange and red. As the color moves toward red, the level of attention is more acute and the individual should likewise be more prepared to react. White – Unprepared for Self Defense: This is the most relaxed of all stages. The individual is largely unaware of their surroundings and completely at ease, whether it be at home, in a secure location or even asleep. This is when people are at the most risk of being surprised. Yellow – Partially Aware of the Situation: Although this is still characteristically relaxed and at ease, the individual is aware of their surroundings and able to appropriately respond or indicate areas of risk or danger. Those in stage yellow make conscious decisions to position themselves in such a way that increases their awareness, like sitting facing a door or window. Those in this frame of mind are aware of their surroundings, but are not stringently scrutinizing individual factors. Orange – Determining the Threat: This heightened stage of awareness is when a potential risk or area of interest has been identified and must be focused upon. The key here isn’t to lose total awareness of surroundings, but rather actively or indirectly engage and determine whether or not the point of interest is a threat. The expectation for potential harm has been identified, and the individual should be prepared to engage the threat in some shape or form. Red – Concealed Carry Interactions: The moment the area or person of interest shifts and becomes a threat, the individual moves into stage red and identifies the threat as a potential target. The target is not necessarily dispatched, but the individual is ready to engage if need be. This is when tunnel vision can happen and why those in this condition should move to an area of tactical advantage. Actively training can help ward against the inability to perceive other areas outside the threatening target. 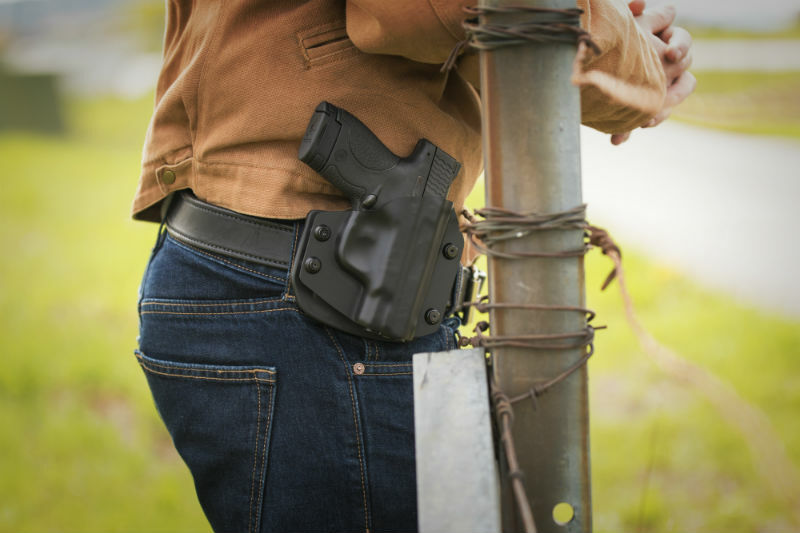 Whether or not someone is carrying openly, concealed or not at all, situational awareness is a means of preparing for all manners of threats, be it bodily, mentally or even in areas of life like a career or a relationship. Knowing what’s going on and how to react is just a common sense method of avoiding negative outcomes. Jake Smith (@notjakesmith) is a copywriter in his final year of studying public relations and apparel at the University of Idaho.